Home > wagyu > It's Hinamatsuri in Japan! Come celebrate with eating great Japanese food! It's Hinamatsuri in Japan! Come celebrate with eating great Japanese food! Today is Doll’s Day, or Girl’s Day in Japan (Hinamatsuri). 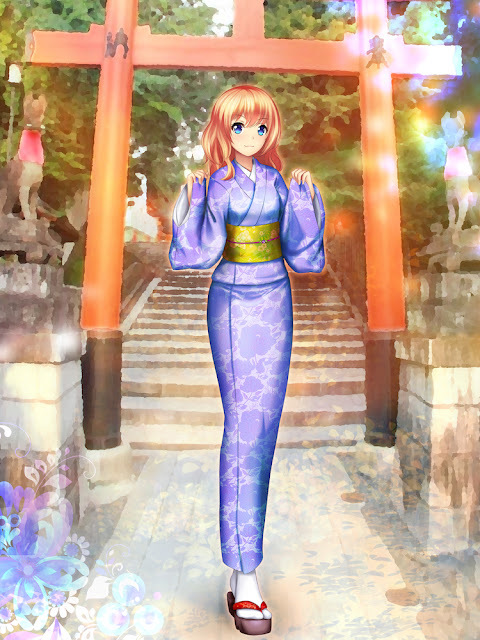 One of the lesser-known Japanese special days outside of the country, it’s nevertheless an important religious holiday, and I thought it might be nice to highlight it here today. 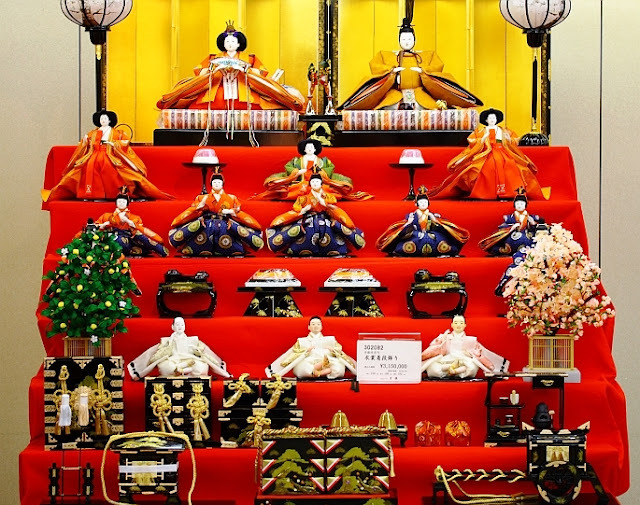 Hinamatsuri is, as the name suggests, a day where Japanese families lay out a seven-tier display of dolls that represent the court of the ancient Heian period. At the top are the Emperor and Empress, and then on each row underneath that are dolls that represent lower classes of people in the court. It’s a visual effect that very much speaks to the Japanese people’s love of hierarchy, and after being presented on a red cloth, the whole display is really quite grand. The reason the Japanese do this is due to their belief that dolls can contain and remove bad spirits from an environment, and Hinamatsuri is specifically designed to protect the children of the household. Dolls hold a lot of power in Japanese spirituality, perhaps dating all the way back to the first people to settle in Japan who had a great reverence for the power of clay dolls, or dogu. These displays are also pulled down the moment the festival finishes, because to leave the dolls out into March 4 is to risk the daughter marrying late. And we can’t have that! One of the most interesting things about Japan is that the nation’s sense of spirituality remains very much its own. 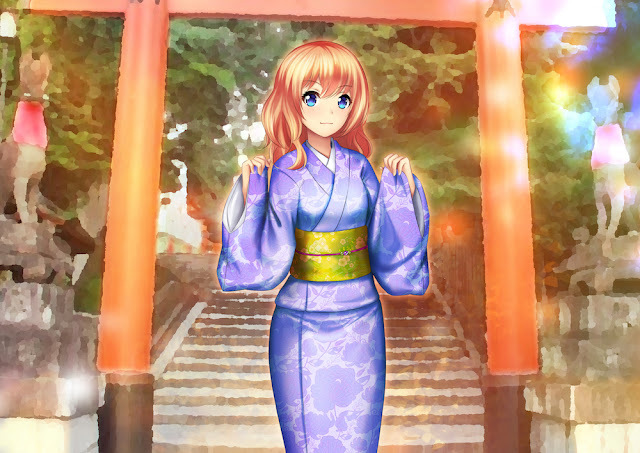 Relatively untouched (and many would say unburdened) by Christianity, Islam, and even Buddhism and Hindu, traditions such as Hinamatsuri could only really happen in the country because the people continue to believe in a spirituality that holds that spirits – for good and ill, still exist all around them. The food culture is far richer than sushi, I can assure you. Not technically a food, but sake is an essential accompaniment to any decent meal in Japan. “Rice wine” has a taste quite indistinct from most other spirits, and it does have a learning curve, but once you’ve tried a couple of different varieties, you’ll generally start to acquire a taste for it. 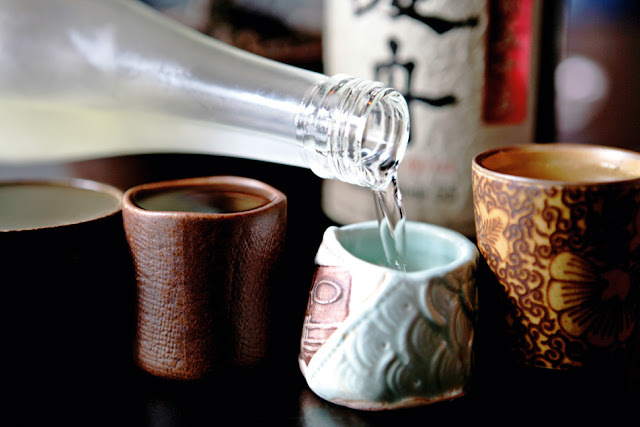 A popular misconception is that sake should be consumed hot. This is because that’s generally how cheap sake is prepared (mostly to hide the flavour), and most of the sake you’ll find outside of Japan is terrible stuff. Inside Japan, though, find a good bottle of sake and drink it cold. Okay, I’m getting to the food I promise, but I wanted to highlight my favourite summer drink in Japan, too. Japan is a very humid country, and though it’s not tropical (well, Okinawa aside), in summer the heat and humidity combine to be truly oppressive. You guys don’t know what I suffer through to go to TGS for you each year. But plum wine in a glass filled with ice is a lovely refresher. Generally quite sweet, it’s nice when there’s a hint of the plum’s sour running through the wine too. 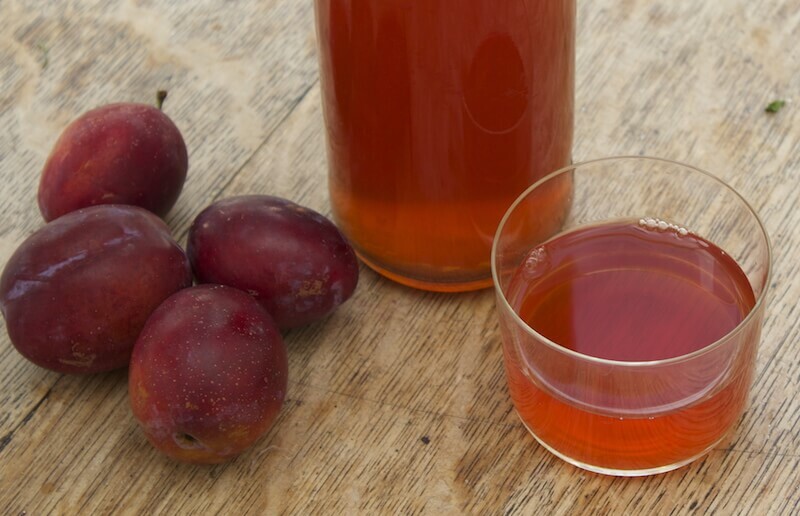 And the actual plums that are left after making plum wine are OH. MY. GOD. God created fruit to be stewed in alcohol for a ridiculous length of time. Forget about the whole seafood thing – Japan has the best meat ever. A good piece of wagyu meat is gloriously marbeled and creamy, with delicate flavours that simply dance over the tongue. As a nice contrast to the big slabs of dead cow that western restaurants hurl at you, wagyu servings are small and expensive, but this is very much a case of quality over quantity. Each region in Japan has its own wagyu tradition, and some areas are known for having better quality meat than others. My personal favourite is wagyu that comes from Yokohama. 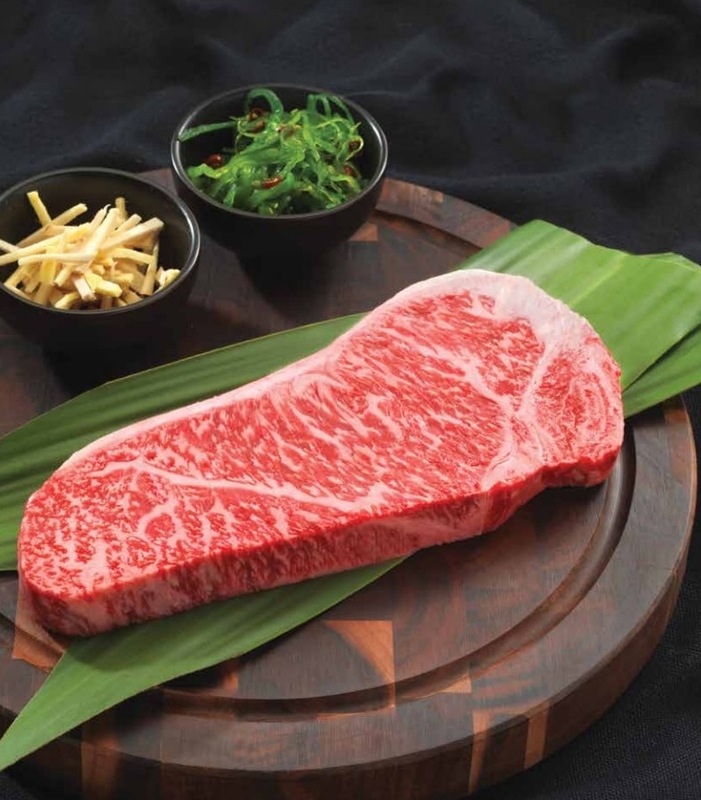 Kobe’s wagyu is also in huge demand among gormets around the country. Oh I could live on gyoza for ever and ever and ever. Japan’s dumplings are just the most spectacular casual dining food ever invented. A typical filling is pork and a strong-flavoured herb like chive, but there’s all different kinds out there, including seafood and vegetarian. Gyoza can be boiled, pan fried, or deep fried. Better yet you can have all three and call it a three-course meal (which I have done more than often, I can assure you). It’s generally eaten simply – a dip in soy sauce and down the hatch. 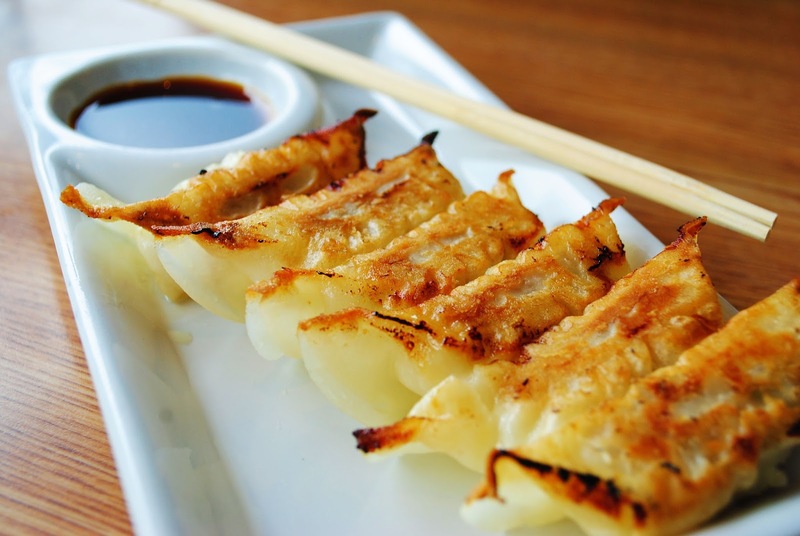 A popular Friday or Saturday night hobby for Japanese people is to catch up with a group of friends and spend a couple of hours snacking on gyoza and drinking beer. It’s heaven. A very traditional sweet, these star candies are the kind of sweets that you’ll find sold at festivals, out the front of temples, or gorgeously wrapped up as gift boxes to bring back home. 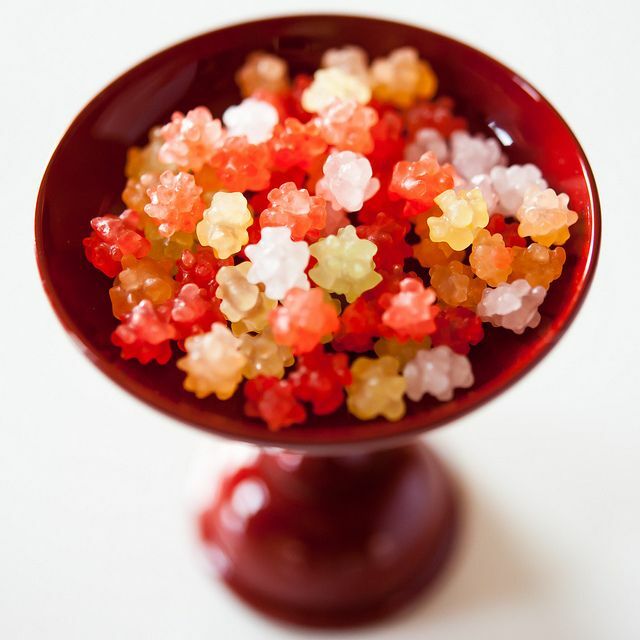 They really aren’t much more that balls of hardened sugar with some colouring added, but because they are so bright and colourful, they look gorgeous when there’s a whole lot of them in a bowl or packet. Most Japanese kids grow up looking forward to these as a treat after visiting a temple on a holiday, and I generally bring back packets of these as souveneir gifts for friends and family, because they go down so well.